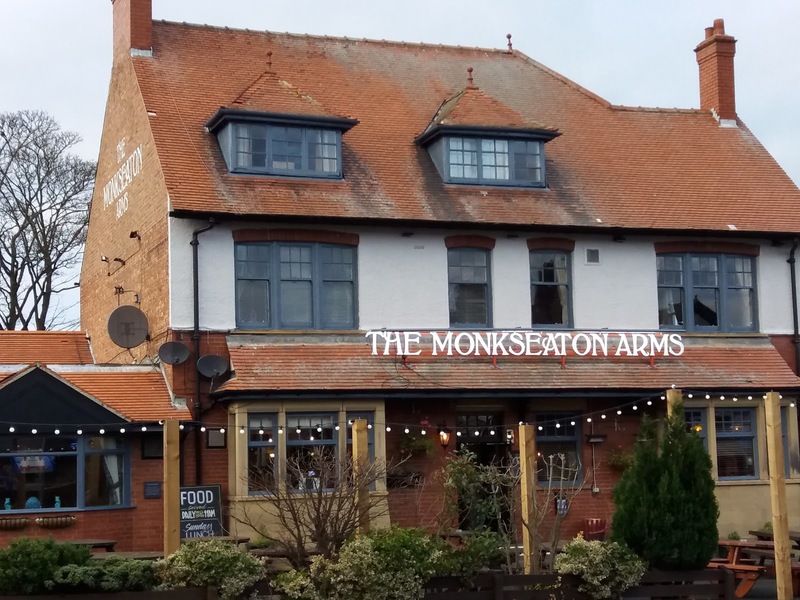 Jazz Street that's Monkseaton's Front Street. 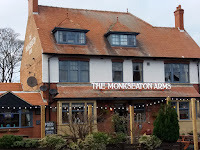 The Ship Inn, lunchtime Tuesday, there is jazz, it is hoped a monthly Sunday session will soon resume at the Black Horse, and every Friday, come hail or come bright winter sunshine, Maureen Hall's Rendezvous Jazz can be found at the Monkseaton Arms. 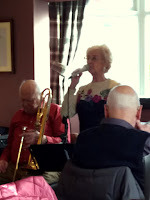 As usual, all seats were occupied as singer Maureen Hall called the boys over from the bar for the band's regular one o'clock start. Give Me Your Telephone Number for starters. Hall followed up with a vocal number - You Belong to Me - assisted by excellent support from the band; Jim McBriarty, clarinet, playing his final gig with the band before heading off to pastures new, trombonist Don Fairley playing as well as ever, Malcolm Armstrong on top of it all playing keyboards, and the man at the back, singing drummer George Davidson. Don Fairley in Teagarden mode featured on A Hundred Years from Today - a class act is Mr Fairley. Please Don't Talk About Me When I'm Gone pleaded Hall as your scribe went to the bar to replenish a glass with - it couldn't be anything other on the day Fuller's Brewery sold up for £250m - another London Pride. 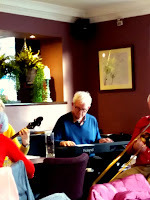 The raffle came and went, pub meals were polished off and in no time Rendezvous Jazz returned for a second set. Ah, yes, the second set - by tradition, the great Doris Fenn joined the band. Banjo, no a banjolele, is Fenn's chosen instrument. It's a Long Way to Tipperary sang Davidson, Hall sang Dream (one of the highlights of the afternoon), the band ripped through Swing That Music, later they told us about Martha and as the three o'clock finish approached Hall made a call to Dr. Jazz. 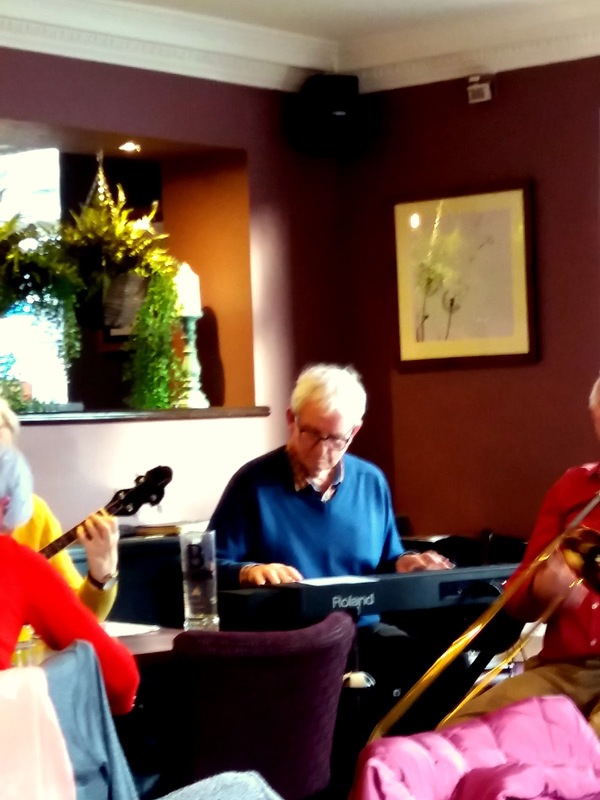 Next week (Friday, February 1) with Jim McBriarty gone and Don Fairley away for a few days, bandleader Hall has drafted in a couple of handy deps - Mr Mick Hill, trumpet and Mr Neville Hartley, trombone. So, another good session is on the cards, one o'clock sharp.